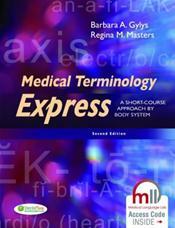 Now in its 2nd edition, Medical Terminology Express adapts Barbara Gylys's proven word-building techniques for the short-course. Organized by body system, this text shows the connection between anatomical structures and associated medial word roots. The Medical Language Lab is the new, interactive, online program that ensures your students master the language of medicine. Based on proven language methodology, it guides your students step by step from basic through advanced levels of proficiency to become confident medical language speakers. A special code in the front of the book unlocks The MLL for you and your students. Use it with your current learning management system or with its integrated grade book. Customize it to meet the needs of your course.